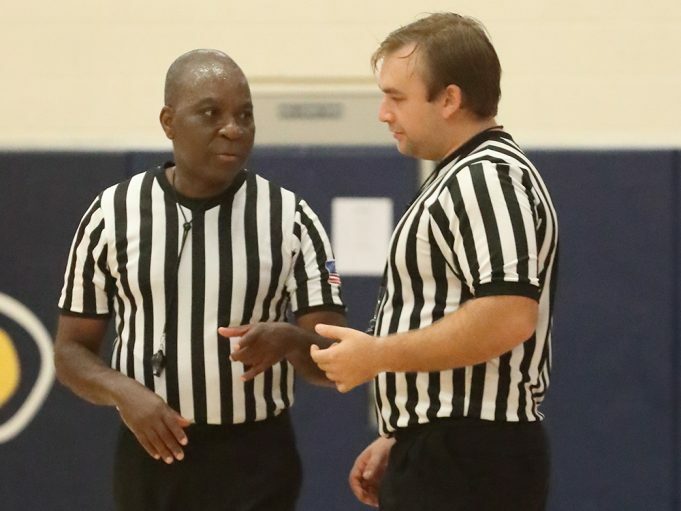 The following “Timeless Tips” were originally targeted at first-year officials, but we believe all officials can benefit from these nuggets of wisdom. Enjoy. You learn how to better express yourself so others understand exactly what you mean. You’re going to get yelled at. You’re going to spend more than you think on the uniform. During the offseason, you use vacation time to attend camps — and enjoy it. You become a better planner because you must prepare for traffic and weather to get changed in time for a pregame conference with your partner(s). On the weekends, you officiate a lot of games to learn, improve your skills and for the sheer joy of being part of the contest. Good shoes are important for foot, knee and back health. Though you may not like politics or networking, they come into play regardless. The semifinals are often more intense than the finals. You’ll learn to ignore (or handle) obnoxious fans. At some point, you come to understand that officiating is about the journey. Every game counts, so hold onto moments of joy. Breathe. It will get stressful but staying calm will lead to better resolutions. You learn how to defuse anger in others. Improve how you dress and respect for you grows. Long after you retire, you will wish you were still officiating. There will be partners you like, partners you hope you never work with again and partners you want beside you when all hell breaks loose. You learn to admit you’re wrong and move on quickly. Displaying confidence in your tone of voice and body posture goes a long way to preserving and promoting your credibility. Officiating teaches you to become a better leader. Mastering the definitions in the rulebook is critical to understanding the rules. You improve your listening skills or perish. Get a mentor, and later in your career, be a mentor. You learn how to enforce rules judiciously. You figure out how to build a strong team. People look at you with respect when you walk out of the locker room if you carry yourself with the proper demeanor and attitude. You become a continuous learner out of necessity. You understand the importance of being a great partner. You will be evaluated. Those evaluations will help you develop. Most of the time. But not always. Some game administrators work really hard to take care of you and some simply see you as a necessary nuisance. Sometimes you have to ignore minor illnesses and injuries — and keep going. Putting bad things in the past will become the norm. Look through the windshield, not the rearview mirror. The action isn’t always where the ball (or the puck or whatever object being used) is. You’ll drive your spouse/significant other crazy with your officiating stories. Assigners do play favorites. How to become one of those favorites is by having good availability, showing up on time, being dependable and developing a good reputation. You will find that proper hydration and nutrition matter. Fitness is critical — you need to be as physically capable in double overtime as you were for the opening play. Not every veteran is willing to help you. Wear the proper uniform for your level. What the pros wear isn’t necessarily what you should be wearing. You need to have uniforms and undergarments for all sorts of weather, and there are times you will have to pack all of them because conditions will change between the time you leave home and the time the game begins. You will actually learn the rules, rather than just thinking you know the rules. You start to watch college/pro games from an officiating perspective instead of just a fan’s perspective. There is no substitution for repetitions. Get out there and work every chance you get. See what you call; call what you see. Don’t let an injury linger without treatment; get it checked out early before it gets worse and ends your season. Advancement may come slower than you expect — but better a year too late than a year too soon. 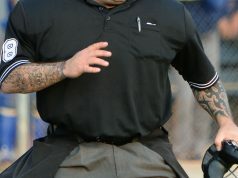 You learn to take care of your officiating gear because it’s not inexpensive. 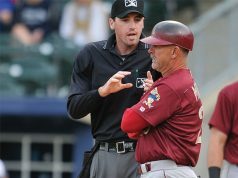 You will sit in the stands and mumble “you’re wrong” every time you hear another person in the stands yell at the officials because said fan does not know the rules. You won’t work varsity right away — and shouldn’t.